The Georgia Public Safety Training Center recognizes the Georgia Peace Officer Standards and Training Council’s traditional tracks for career development and offers the courses leading to Supervisory and Management Certification. The Supervisory and Management Certifications allow law enforcement officers and managers to obtain the credentials needed to serve in executive positions within their local agencies. 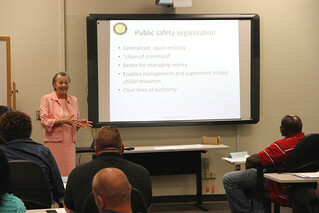 Completion of the Supervisory and Management training programs leads to certification by the Georgia Peace Officer Standards and Training Council. Candidates seeking to enroll in GPSTC’s Supervisory and Management certification programs must meet the pre-requisites for each course within the program.